Adguard browser extensions are especially popular among users — they are being used both in integration mode with Adguard desktop apps and as a standalone solution. Today we are happy to announce the release of a new version of Adguard Browser extension! Granted, the changes made are mostly ’behind the scenes’, and not a lot of users will notice them. However, they are still important, and we will describe the most noteworthy of them below. The whole list is just too big to fit in here (and mostly boring for an average user, to be honest), so if you are interested, it is available on GitHub. 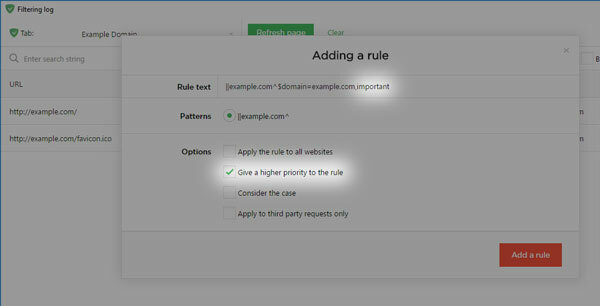 This one is a rather obvious: when you create a new custom rule via the Filtering log, you can now give this rule a higher priority by ticking the respective checkbox. The $important modifier was available before, but you had to manually add it via the user filter. This one is strictly for the rule creators, as it requires the basic understanding of the Content Security Policy security layer. This modifier completely changes the rule behavior. If it is applied to a rule, this rule will not block the matching request. Instead, the response headers are going to be modified. You can find the syntax and examples for the csp modifier inside this issue. Simply put, code refactoring is a process of restructuring the existing code without changing the external behavior the end user observes. We had been waiting for this for so long, it took a lot of time, but now the code is much more simple and convenient to work with. Adguard Browser extensions are open source, which is not a secret. For anyone interested, the extensions’ builds themselves are now available directly on GitHub, and all the updates will be stored there. The build names are now more clear and understandable. There are few notable changes in this release that take place in the Firefox version. First of all, the WebExtensions technology for Firefox has finally been released, which allowed us to completely revamp the extension code. It now greatly resembles the code for Chrome extension, which makes it much easier for further development among other advantages. A lot of other improvements have been done, too. Are you an avid rules creator who is excited for the new toys to play with? Or maybe you have randomly stumbled upon our blog? It doesn’t matter; all opinions are equally welcomed here, let us know in the comment section. Understanding the importance of our personal data, we are forced to maintain a certain balance between security and openness. We have to share our data if we want to buy online, use apps and services. But, trusting our data to a certain business, we expect that it would use it within laws, ethics, and would take our interests into consideration. We decided to investigate several popular mobile applications and see which third parties have access to the personal data of their users. Just a few days ago, Apple announced that they "have never allowed apps on the App Store that are designed to interfere with the performance or capabilities of other apps". In this article, I'll explain the current state of things and - the show must go on! - tell about the new version.